Wobbly: Jon Leidecker has been producing music under the name Wobbly since 1990, improvising with recordings to produce music which inherently resists the act of being captured. Recent performances deploy a battery of mobile devices driven by their built-in microphones, reacting instantly with error-prone variations on the notes and sounds they believe they are hearing: a tightly-knit orchestra with inhuman reflexes, resulting in structures which the human performer influences more than controls. Your phone is the instrument, and your phone is always listening. Wobbly's live and studio collaborations with Negativland, Dieter Moebius & Tim Story, The Freddy McGuire Show, Matmos, Fred Frith, John Oswald, Thomas Dimuzio, Huun-Huur-Tu, Sagan and Tania Chen compliment live mix media collages broadcast twice a month on KPFA FM's Over The Edge radio program. Kanoko Nishi-Smith is an artist currently based in SF/Bay Area. Despite her early training in classical piano performance and past involvement in Contemporary/New music performances, her most recent interest has primarily been in improvisational music making, both in a solo context and in collaborations with other artists. 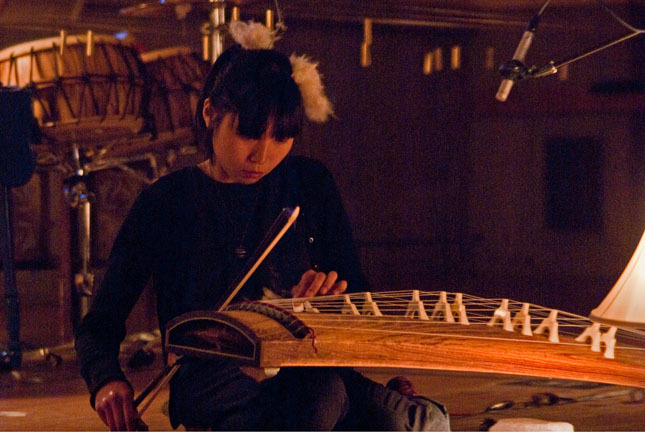 She has been exploring both on the piano, as well as on her second instrument, koto (13, or 17-string Japanese zither), various extended techniques, widening the range of vocabularies on each instrument and enabling them to adapt to different situations, both musical, and interdisciplinary. Smomid is a project by Nick Demopoulos, who is a performer, musician and instrument builder. Smomid only utilizes instruments he has designed and built to perform interactive computer music. The name is derived from an acronym of his primary instrument: “String Modeling Midi Device.” Smomid music often features glitchy and scattered beats, sampling, abstract textures, ambient spaces, and improvisation. Smomid music draws on many varied influences and creates bizarre juxtapositions with deft sonic versatility, with samples of heavy beats, Gregorian Monks chanting and Taiko drum sounds all coexisting comfortably.